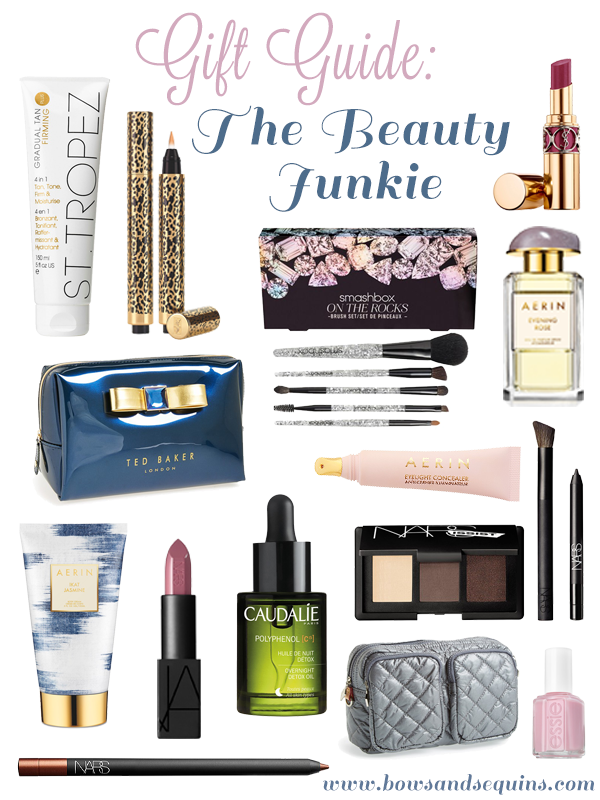 Today is all about the beauty junkie in your life. The girl who’s obsessed with Birchbox*, who’s addicted to the checkout lanes at Sephora (guilty.. they get me every time), and who is always carrying at least four lipsticks in her purse. Sound familiar? These gifts are for her! I was never really a beauty junkie until my first job in New York. I managed social media for a company that owned eight cosmetics, skincare, hair care, and fragrance brands. We did most of the product development in house so I became quite the guinea pig. For 16 months, I was always testing new hair sprays, lip colors, moisturizers, fragrances, and even men’s facial scrub. Needless to say, I became kind of obsessed with trying out new products! *If she’s not already a Birchbox member, a subscription is a fabulous gift idea! Lauren recommended this nighttime detox oil and I fell in love. I’ve been wearing the new NARS Audacious Lipstick like every day. I’ve been experimenting with this smoky eye kit.. Great for beginners! (I feel like I’m so bad at eyeshadow.) Lauren P got me this cosmetic bag for my birthday and it’s just so cute! This is my absolute favorite hair product… ever. This spray is absolutely magical. My go-to fragrance. Favorite tinted chapstick. Must-have leave-in hair product. The very best dry shampoo. Can’t get enough of these serum capsules. Favorite Self-Tanner. I could go on and on… Maybe I should write about beauty more often? You tell me! That dry shampoo along with Blopro is my favorite! Even with my dark hair. I put it on at night and it soaks up the grease as I sleep. My hair looks great. I’ve heard fabulous things about the YSL lipsticks! I really want to try one! Great suggestions! How cute is that Ted Baker bag? Fabulous round up – a birch box subscription would be an amazing gift! SUCH A great guide! Who doesn’t need a little St. Tropez this time of year?! Lipsticks and Nail Polishes are always my go-to beauty gifts for my girlfriends. You can never have too many! I’m such a fan of that YSL lipstick. I love it in every shade. This is so great! My friends are most definitely beauty junkies. I can’t wait to check all of this out! This past year or so I have become a major beauty junkie! I definitely miss all the magazine beauty sales where I could get amazing products for only $1. I have a thing of St, Tropez spray that I have yet to try. I should probably use it now that I am a lovely shade of ghost white. Great idea, I have a friend that would love all of these. Hahaha that so me, too! I’m a complete beauty addict. It started when I was about 14, spending all my pocket money on new products (my family fell over laughing when I bought eyeleshes conditioner). Not much changed for me in that department 🙂 Great selection- I already own half of the items and they are truly great! 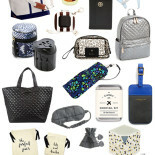 I’m such a beauty junkie…this is my dream to find all this under the tree! Great roundup! I’m OBSESSED with Nars lipstick – I really should try their other items! Yes! I love beauty themed post! I’m quite the product junkie myself. Great Picks! I feel that every girl is a beauty junkie. You just have to find out what product she can’t live without. I love love love that Ted Baker makeup bag! I have it already in black and pink! Your beauty posts are fabulous! Please do more – I’m a big fan!